Members of the Spanish government reached out to Constitutional Court judges on Saturday before they met to decide on Carles Puigdemont’s disputed reinstatement as Catalan president, which is expected to take place at the Catalan Parliament on Tuesday, as reported by the Spanish newspaper El País. Last Friday, the executive in Madrid challenged Puigdemont’s candidacy for president, which had been announced by the Catalan Parliament president Roger Torrent. The Spanish government went ahead with its appeal despite the Council of State—an advisory body—rejecting the possibility of acting before the investiture effectively took place. Pro-independence parties have repeatedly pledged to reelect Puigdemont—even though his reinstatement poses several difficulties. Puigdemont faces criminal charges for his role in the independence process. Additionally, he left the country last October after being dismissed by the Spanish government, and has been abroad ever since. According to the newspaper, the Spanish government “panicked” when it discovered that the Constitutional Court judges were divided, and especially when the possibility of them not accepting the appeal for review was brought on the table. It was then when the Spanish president Mariano Rajoy warned judges of the serious consequences that Puigdemont’s reelection at a distance would have. Eventually the Court postponed the decision over whether to accept the appeal or not. Instead, it ruled that Puigdemont would only be allowed to retake his post if he turns up in person at the investiture debate with a judicial authorization. It also advised Parliament bureau members that, should they allow Puigdemont’s swearing-in, they could face criminal charges too. The Spanish Constitutional Court has allowed Carles Puigdemont’s candidacy for president, but only if he turns up in person. After around six hours of deliberations, the judges decided not to accept Puigdemont’s bid if it is made from Brussels. Thus, the Spanish court will not allow him to be sworn in as Catalan president at a distance or with another MP representing him. What’s more, the Spanish Constitutional Court also stated that if Puigdemont wants to stand as the candidate, he will need previous authorization from a judge. Yet his lawyer, Jaume Alonso-Cuevillas, said that Puigdemont is “far” from asking for judicial authorization. 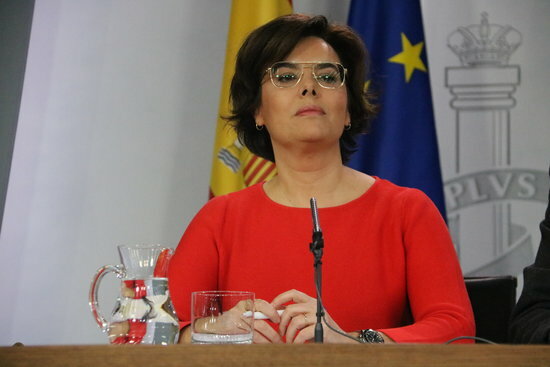 Despite the Spanish Constitutional Court not yet saying whether it admits or not to the Spanish government’s appeal against Puigdemont’s investiture, the Spanish vice president, Soraya Sáenz de Santamaría, stated that the Spanish Constitutional Court “clearly said that he has to present himself before judge.” Still, she stressed that the court’s decision does not affect Rajoy’s cabinet “at all”. “We, the members of the Spanish government, are satisfied every day because we fulfil our obligations,” she pointed out.